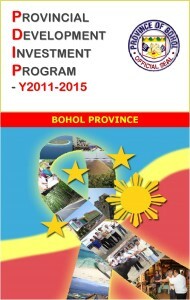 The Provincial Development Investment Program (PDIP) 2011-2015 of Bohol is a vital six-year planning document that ranks priority projects, programs and activities (PPAs) identified in the Provincial Development and Physical Framework Plan (PDPFP). Of the total 720 PPAs subjected to project ranking costing about Php 3.3 Billion over the four-year period, only 123 are included in the prioritized list which can be adequately funded out of Provincial Government resources. Although this number is less than half of the total proposed PPAs, it is worthy to note that most of these prioritized projects are continuing and are provided with multi-year budgetary allocations. 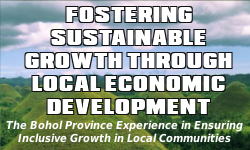 For the period 2011-2015, the priority investments for the province amounting to Php 1.563 Billion are anchored towards the realization of the HEAT Bohol development agenda of the Chatto administration. The PPAs are classified into Sectoral Services where 29 Infrastructure Development projects got the highest share (40%) of the total investment cost. Next is Social Development with 18 projects which account 31% of the investment cost. About 15% of the total investment requirements for the four-year period are allocated for the 41 Economic Development Projects. On the other hand, 20 projects are scheduled for implementation for local administration and management to share 9% of the total cost. Finally, 15 projects are expected to be pursued for Environmental Management that would require only 5% of the total costs of the planning period. With a projected yearly increase of 11-12% in revenues, about Php 1.2 Billion revenues is expected in 2011 to Php 1.8 Billion in 2015. On the overall, the revenue projection reflects an optimistic growth of local revenues that reduces the internal Revenue Allotment (IRA) dependency of the Province. For the projected period, IRA dependency is expected to decrease from 92% in 2011 to 89% in 2015. The Provincial Government is projected to hit a Php 1.1 Billion expenditure in 2011. With the expected increase in spending, it will incur a total of Php 1.4 Billion and Php 1.7 Billion expenditures for years 2013 and 2015, respectively. With the estimated level of spending for debt servicing, the Debt-Service Ratio to Regular Revenues of the Provincial Government is projected at only 2.49% in 2011, 1.755 in 2013 and 1.20% in 2015. These figures are way within the limit of 20%. A total of 433 PPAs amounting to Php 50.23 Billion do not require funds from the Provincial Government. Of this, 28 PPAs worth Php 1.945 billion are to be funded by non-government agencies while 96% of the investment requirement will come from the City and National Governments and other sources. There are 176 projects worth Php 3,364,715,079.20 considered under the portfolio of standby projects. These ranked projects starting from rank 141 are included in the prioritized list but could not be included in the PDIP due to financial constraints. They are listed in the standby projects due to inadequate new development investment financing potential to meet their total investment costs on an annual basis. Sir/Ma’am Good Day! I would just like to ask if those projects investment would also cover the tourism industry in our province. I’m currently having my thesis research for a 5 star in-city hotel that also cover amenities that is new to the city,my project location is in Brgy. Dampas. I am a graduating student of Architecture here in Manila and I was suggested by my panel to look for a specific agency that could assume to be the investor of project. I am seeking suggestion from your good office if you have any ideas on companies that willing to invest such project and I will just ask a certificate from them to validate my project through my panel. Rest assured that this will be just a school requirement and purpose. Hoping for kind consideration. Thank you. As to your query, the Provincial Development investment Program (PDIP) of the Province of Bohol covers only government projects to be implemented by the Provincial Government. In some cases, we do projects with the National Government Agencies, LGUs and CSOs. For your particular concern on Tourism Development (5 star in-city hotel) in Tagbilaran City, may we respectfully inform you that our office is not directly involved in handling investors for such projects. May we suggest that you contact the City Government of Tagbilaran , particularly the City Planning and Development Office, to check if they have knowledge on any investor that have signified interest in developing a new hotel in Tagbilaran City. Thank you Sir for your kind answer. I will just contact the City Engineer’s Office. Again thank you so much sir.